The artist created a new typographical work, formed through translating the geometric grammar of the façades of terraced homes found in the city, resembling the letter “A” into something we read as language. I used to believe I was cursed whenever I visit Belgium. It is either rainy or snowy. I remember the news that last December was the gloomiest December in Belgium in more than 80 years. The sun shone for a grand total of 10-and-a-half hours last month, less than a quarter of the ordinary December average, which is 45 hours and eight minutes. This time, though, I was lucky and I think the curse was lifted, even though the temperature was around 1 degree Celsius, the weather was quite sunny. I was in Belgium again last year to see the group show that Nil Yalter was part of at WIELS. 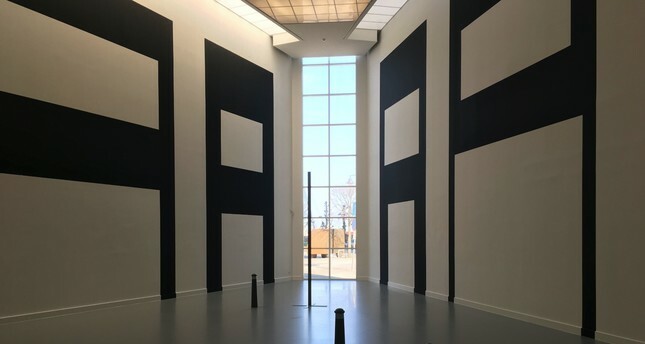 This time I am in Belgium to see Cevdet Erek's solo exhibition at the M HKA museum in Antwerp. This exhibition is part of a program of the museum called IN SITU, which offers medium-scale monographic exhibitions by significant early and mid-career artists from around the world. Erek's solo exhibition, "AAAAA," is open until April 29. Although I planned to attend the opening of the show, because of the storm in the Netherlands, most of the trains were cancelled. However, last week I had a chance to see Erek's exhibition. I did not check anything and had no idea what it was about before I went. I must admit, I was expecting to listen to the show, to some rhythmic pieces, as anyone who is familiar with his practice. But Erek did something that I was not familiar with, it was something new - a new path in his artistic life that is more experimental, where he did a new material investigation. Erek's main subjects, the production of space, rhythm and architecture are still here, but this time the artist pushes visitors to use their imaginations to create the sound. The steel car outside the museum is rusty and orange and the one inside (above) is still in good condition. The research for the exhibition can be traced back to the impressions and experiments from a month's work in Antwerp in 2009, according to the catalog. The biggest space at MHKA on the bottom level with a high ceiling is hosting "AAAAA," where Erek placed six giant "A"s, a steel van and street objects that you see on sidewalks to prevent cars from parking in the pedestrian space. The installation's street objects echo to the outside of the museum and can be seen through the ceiling size window. "At the heart of the installation is a new typographical work the artist has created, formed through translating the geometric grammar of the façades of terraced homes found in the city that resemble the letter "A" into something we read as language," the catalog explains. Erek also shows a map on an advertisement board, which supports my idea of echoing space. The first part of the installation - this could change if you start outdoor part of the show - has a shelter and the other part has no shelter. The steel car outside the museum is rusty and orange and the one inside is still in good condition. A map on an advertisement board. This shelter's effects, or having a roof, reminded me of a quote from French philosopher Gaston Bachelard's book, "Poetics of the Space," where he says: "Verticality is provided by the polarity of the cellar to the ceiling. The traces of this polarity are so intricate that for a phenomenology of imagination, a look represents two different axes. In fact, the wisdom of the roof and the unreasonableness of the basement can be confronted without requiring any comment. The roof puts the reason for existence at first glance, covering the top of the person who avoids the rain and the sun." Erek is interested in the relationships between spaces inside and outside the museum, and he tries to break down the powerful effect across the gallery space, which he mostly does with light or rhythmic sounds. But this time he questions the role of streets objects, such as sidewalk barriers, vehicles and an advertisement board, which I would describe as territorial artifacts, and their relationships to people and how they were designed, reformed and reshaped by municipalities to control human behavior. All the big letters represent the façade of certain buildings in Antwerp, which you can see in the catalog. I did a quick search for the house, to see them where they are and what kind of houses they are. While I was expecting to see fancy and designed or historical buildings, what I encountered were houses in suburban areas of the city in mostly immigrant neighborhoods or which are not on the list of tourist spots or those ignored by the municipality. Among all the historical Flemish-style houses in the center of the city, Erek changes the focus of the visitor for those who are curious to look toward the other by making their almost same-size scale typographic façade monumental letter paintings. The artist discusses the contemporary city, which is in a constant state of transition with its territorial artifacts.